HotelPillow.com's Exclusive Feathercloud Bedding System inspired by five star resorts worldwide! Our guests most commonly emailed question or phone call relates to simulating a hotel mattress at home. After careful research both in hotels and homes HotelPillow.com is proud to introduce bedding systems that will give your home a hotel makeover. 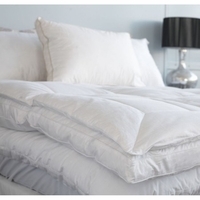 The HotelPillow.com Feather cloud Mattress topper system takes two amazing bedding products and uses both of those products strengths to give you a comfortable sleep platform night after night.